If you have found yourself in the park recently, you may have noticed our Painter in Residence program. The painters will work in the park throughout August and September creating representational imagery of the park. 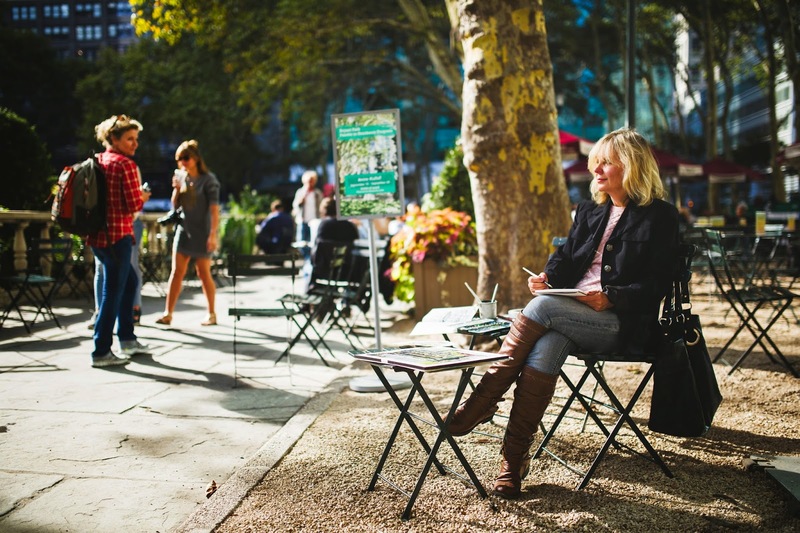 These works can be added to our always growing visual record of Bryant Park. Since all good things must come to an end, our 2014 Painter in Residence program finished up with the residency of Anne Kullaf. A resident of nearby Califon, New Jersey, Ms. Kullaf studied graphic design and fine art at the University of Bridgeport and at The Art Students League of New York. She currently works as a full time faculty member at the Visual Arts Center of New Jersey. She is represented by galleries both in New York and Philadelphia and her work has been included in three traveling museum exhibitions. She has received numerous awards for her work and one piece was recently featured in an article in Plein Air Magazine. Ms. Kullaf sits back in a bistro chair along the 42nd Street Allee. Ms. Kullaf's work seeks to capture the energy inherent in everyday life. She uses "as few strokes as possible" to create bold images full of movement and spontaneity. She aims to "capture the spirit of the landscape as quickly and succinctly as possible...the fewer times I touch the canvas the better." This unique approach to painting is perfectly suited for Bryant Park, a space that is always full of activity. To learn more about Ms. Kullaf, visit her website. Sneaking a peek over her shoulder reveals a beautiful painting of the Bryant Park Grill from afar. 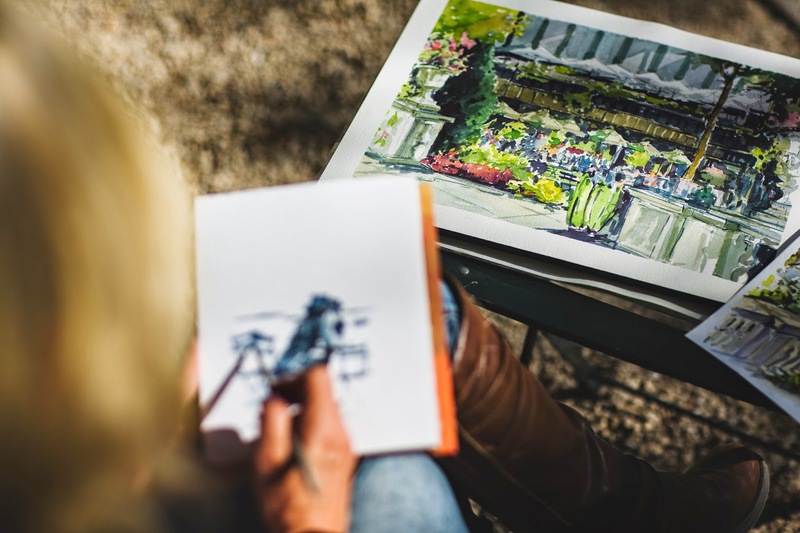 Our 2014 crop of Painters in Residence went above and beyond in creating incredible and creative Bryant Park imagery for us all to enjoy. They each approached the park's scenery and environment in different ways, using different techniques, tools, and colors. We are thrilled to have been the home (albeit temporary) for these talented artists, and are already looking forward to next year's program! We'll miss seeing these painters around the park! 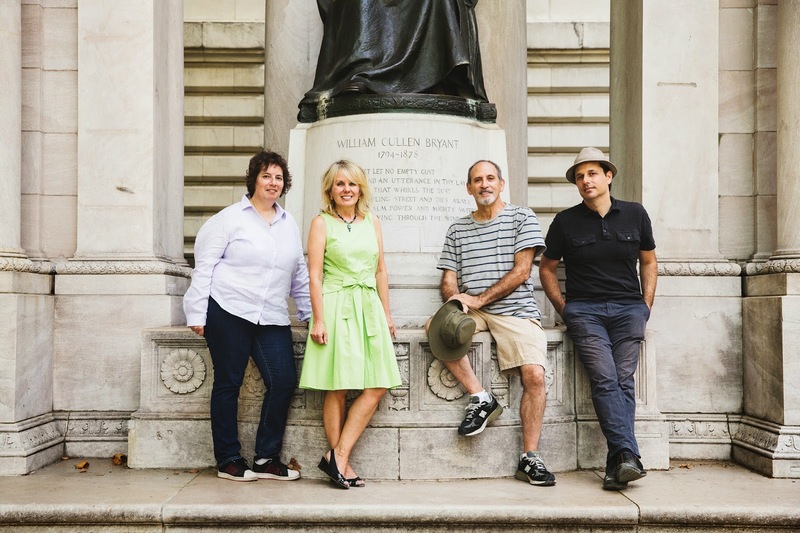 From left to right: Dorrie Rifkin, Anne Kulaf, Peter Salwen, and Simon Levenson.